"Marley Point has an excellent three way swim-through"
Osprey Reef is located approximately 130 kilometres off the Great Barrier Reef in the Coral Sea. It is about 200 kilometres from the mainland. 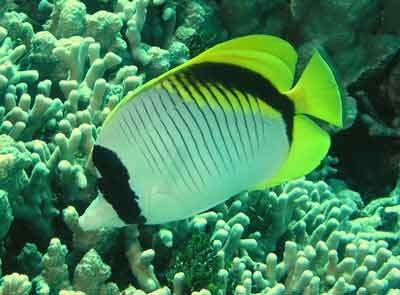 The reef itself basically runs from north-west to south-east and is about 30 kilometres long and 10 kilometres wide. There is a single decent entrance to the only lagoon (which is about 25 to 27 metres deep for the most part) that is located about two thirds of the way from the southern point to the northern point. Boats steam to Osprey from the GBR overnight, with most boats taking about 10 to 12 hours depending on the conditions and where you are leaving the main reef. 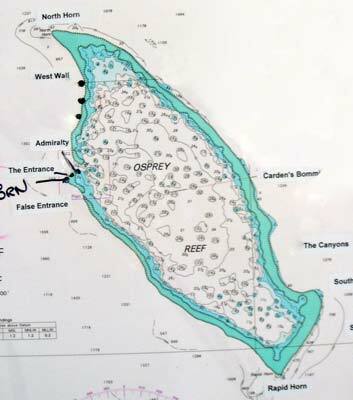 Admiralty Anchor dive site is located just north and inside the western most point of Osprey Reef. 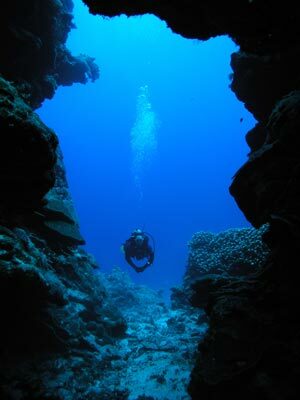 To the north of the dive site is the sole entrance to the lagoon inside Osprey Reef. Care needs to be taken to not get too close on a change of tide as you may be swept inside or worse, out to the open ocean. The mooring is located on a bommie at about 8 metres. The GPS Reading for the mooring is S13° 53' 13.1" E146° 33' 24.8" using WGS84 as datum. It is 311 kilometres north-north-east of Port Douglas. 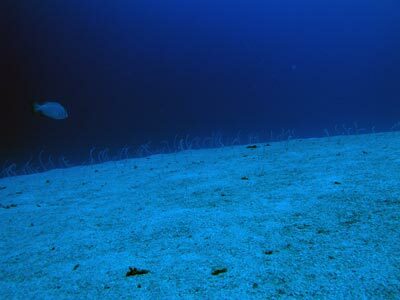 The site consists of a reef composed of lots of large coral bommies which are very close together. The reef runs roughly north-south. The gaps between the bommies are really canyons and gullies. The top of the reef is about five metres and the bottom about 20 metres. From here the sand slopes awy to about 35 metres. On the sand there are lots of garden eels. At 35 metres the bottom turns into a wall that drops to 1000 metres. However, there is not much to see on this wall so the best thing is to start at about 35 metres and work your way up. There is a mooring that is located on the top of one of the bommies. Drop to the bottom below the boat and head north. Work your way to the north around the bommie that sticks out a fair bit. There are hundreds of garden eels to see in this area. From here head up to the reef and then past the mooring to the south. Just past here you will see a large coral that looks like thousands of small pieces of coral growing next to each other. Go over this coral and you will see to the east a dark section at about 17 metres. This is the entrance to a Y shaped tunnel that runs back into the reef. As you enter you can get a very good photographic opportunity looking back towards the entrance. Just inside the entrance is a very old and encrusted Admiralty anchor that gives its name to the the dive site. Who knows what ship lost it? As you go though the cave you will notice that it is more like a very narrow canyon, but it is certainly not a lie to call it a tunnel. You do not really need a torch as there is a fair bit of light inside but one would help. After about 10 to 15 metres there is a choice of ways to go at the Y junction. The left one is narrow and probably should only be attempted by small divers. The right branch goes for about 10 metres before it goes up to the exit. The exit is about 8 metres on the top of the reef. At night, this tunnel is home to flashlight fish. Flashlight fish are small fish that have a symbiotic relationship with a bacteria that produces a green light. The fish has a sort of "eyelid" that closes over the bacteria, making the light appear to flash on and off. There is enough light to enable the tunnel to be seen. Why do the flashlight fish flash? Well, a student who did her Masters on this said "because they can". As you exit you will see that there is a larger gully. Head to the left and follow this to the east. After about 20 metres you can go left back around to the main wall or right. This will lead back to the main reef, but you will have to go over the top of the reef. You can pick the deepest spots so that you do not go too shallow. Back at the reef'e edge, head to the mooring area and spend the rest of the time ascending the main bommie. 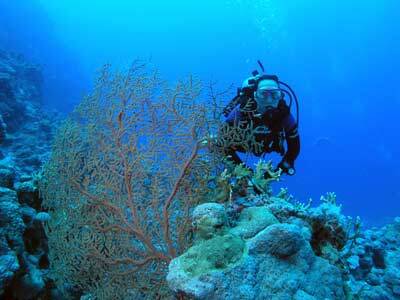 On another dive, head south from the mooring and follow the bottom of the main reef wall. The depth is mostly 20 to 22 metres. A couple of bommies south is one that has a ledge at about 14 metres. This has a very large feather star, the biggest I have ever seen. It is about a metre or so high. However, you will really only see it open at night. This spot has excellent visibility, in excess of 40 metres most times. There are lots of sharks, mainly white-tipped reef sharks. 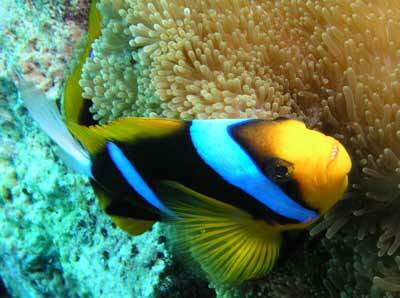 All the normal tropical fish can be seen, including clownfish, triggerfish, cods, trouts etc. This is also an excellent night dive spot. Click here to return to the Osprey Reef article page.